PROJECTS > We are here! AMPLIFY & MULTIPLY was held in Colorado Springs at the Coburn Gallery at Colorado College, from March 27 to April 17, 2017. AMPLIFY & MULTIPLY presented the art of resistance—the varied means in which activism has been channeled into visual expression in the fight against racism, white supremacy, misogyny and other forms of oppression. 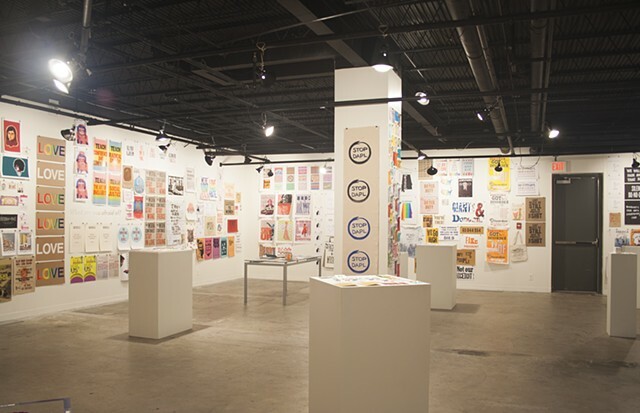 On display was an array of activist/social/political printed posters, protest signs, objects, fundraiser publications and other ephemera produced and used in the 6 months prior to the opening. Over 150 artists, from seven different countries, contributed pieces for the exhibit. The exhibit was sponsored by IDEA and The Press at Colorado College. Almost all of the exhibition is archived in Colorado College's Tutt Library Special Collections, and is publicly accessible.